Product Description: This is the complete story of one of the most remarkable cars of the modern era. After being named both the 2001 North American Car of The Year by a select panel of automotive journalists, and Motor Trend magazine's Car of The Year in its first model year, the PT Cruiser quickly gained a reputation for being fun to drive, great to be seen in and, seemingly defying the limits of its trim dimensions, capable of carrying a multitude of outlandishly sized and proportioned items. All aspects of the PT Cruiser's history from its origin as a concept car to its status as a production model, that has turned heads, stirred imaginations and aroused the automotive passion of hundreds of thousands of enthusiastic owners. are found in this volume. Even a review of the greatest PT Cruiser advertising campaign is included! Joining in depth descriptions of all PT Cruiser models from 2001 through 2007, are details of the development and features of all the famous limited-production PT Cruiser models including the fabulous Dream and Street Cruisers and the elegant Walter P. Chrysler Signature models. 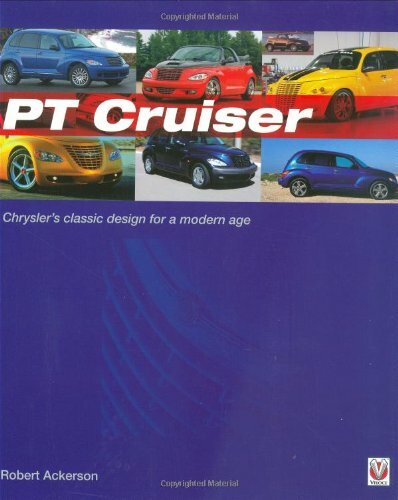 Also included in this great book of the PT Cruiser are the one-off custom models that have Joining this book's lively and authoritative text are hundreds of color photos, listings of available options and a month-by month summary of PT Cruiser sales. Anyone who owns a PT Cruiser, is,considering purchasing a PT Cruiser or admires its too-cool-to categorize looks will find this book, filled with information and photos of one of the most original cars of the modern era, a quality addition to their automotive library.